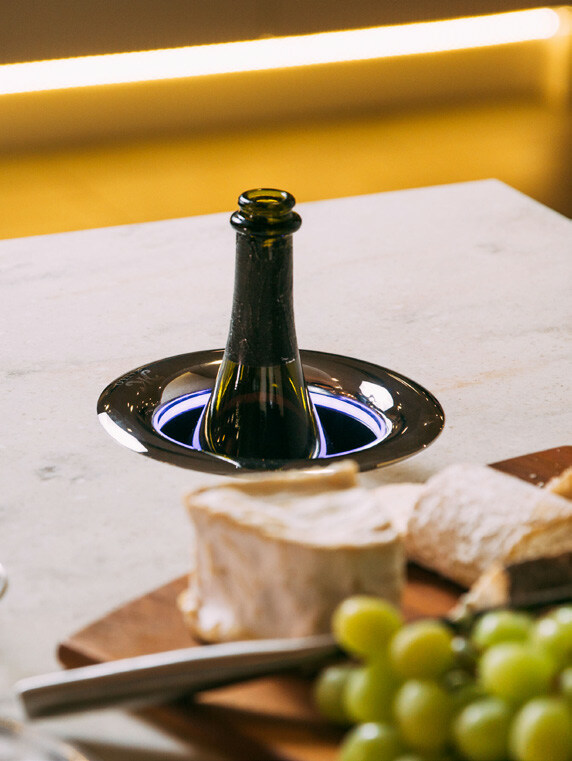 Kaelo is the integrated wine cooler that keeps your wine perfectly chilled once you’ve opened the bottle. 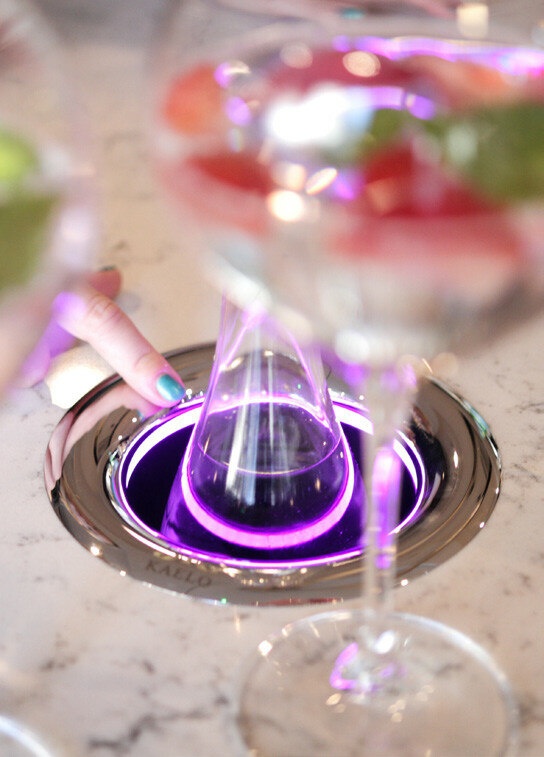 Kaelo can be built into nearly any surface and offers a fun, effortless and beautiful way to drink, serve and enjoy wine. Take a cold bottle from the fridge, put it in your Kaelo and touch the crown. That’s all you need to do. Kaelo will keep your wine within 1-2°C of opening temperature whilst you enjoy it. A great complement to a wine fridge or equally at home on its own, Kaelo means no drips, no refills, no maintenance… just perfectly chilled wine. Seamlessly integrated into any surface or furniture, Kaelo can enhance the design of your home. 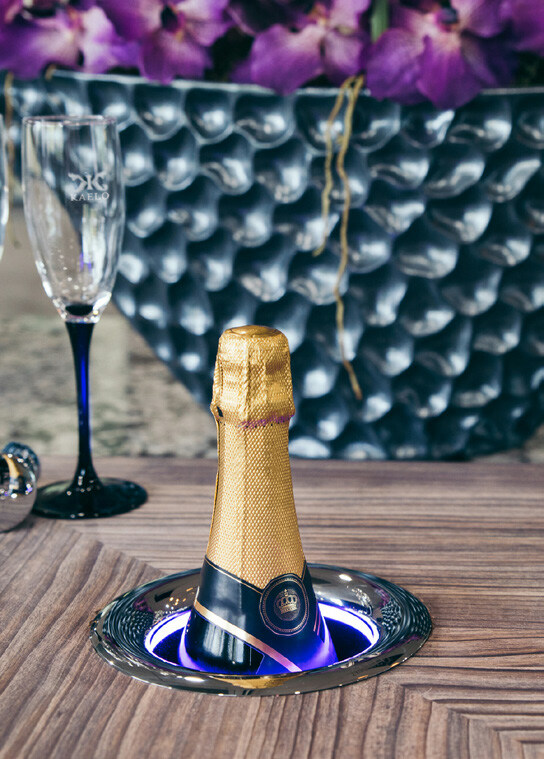 Kaelo also brings a touch of excitement and joy, so whether you’re entertaining friends, having a romantic night in or just eating a family meal, Kaelo can be at the heart of the moments your kitchen was designed for. Kryolux™, our patented cooling system, creates a jacket of cold air which wraps around the bottle, keeping the wine perfectly chilled and the bottle totally dry. Adapted from military and medical technology, Kryolux™ is hyper-efficient making Kaelo cold in seconds, yet using less power than a 60-watt light-bulb. Smart touch technology is fused into the crown so there’s no need for buttons or a remote. Just a touch will turn your Kaelo on, or allow you to select from 27 colours of light. Kaelo is designed in London and hand-built in the Cotswolds by our master craftsmen, who have over 150 years’ experience in precision engineering. 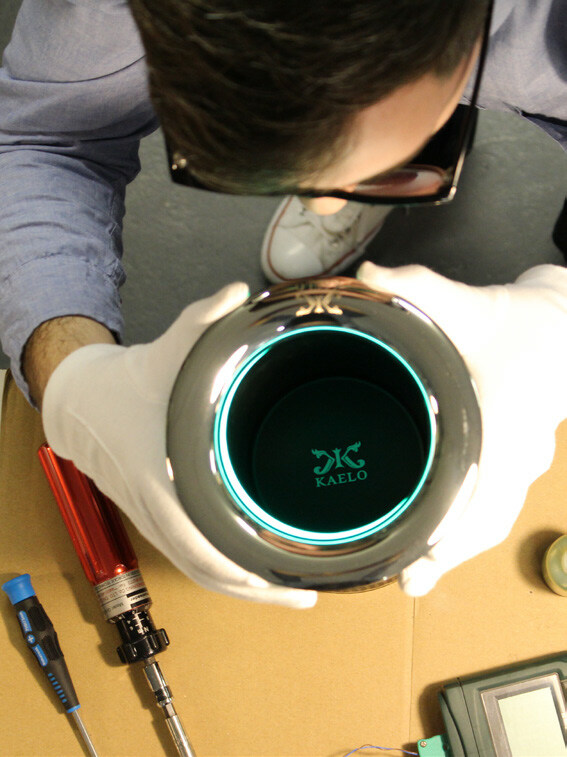 From the seamless curve of the crown to the hard-anodised chamber, each part of a Kaelo is built and tested against strict criteria (we even go so far as to calibrate the tension of each individual screw), ensuring every Kaelo delivers both perfect performance and reliability, before being signed off by its maker. The Kaelo crown is precision machined from a solid block of stainless steel, then polished by hand to a mirror or brushed finish. We use solid steel rather than chrome plating because we believe it creates a better product… it looks better, feels better and gives a better performance. Fancy something different? Choose from seven premium crown colours, each available in a mirror-polished or brushed finish.